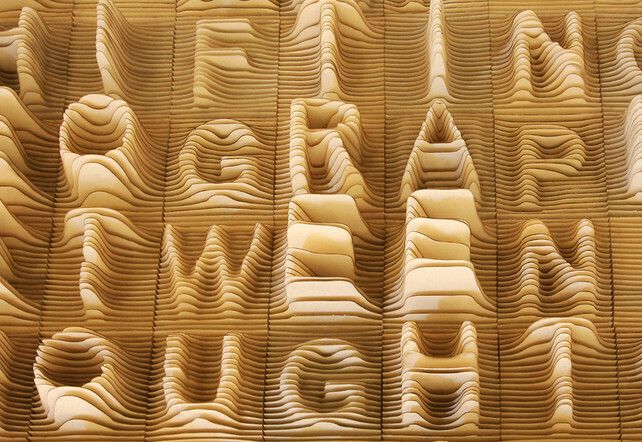 Here’s a poetic idea: a typeface that visualizes letter usage as a set of 3-D topographic maps. Caspar Lam and YuJune Park of the design studio Synoptic Office wanted to represent “language and the ebb and flow of spoken English,” as Park tells Co.Design, so using 3-D modeling software and a laser cutter, they converted each letterform into a 6-inch-by-6-inch butter board sculpture, the height of which corresponds to the letter’s frequency (as defined by the University of Cambridge Computer Laboratory). The taller the letter, the more we use it. Throw all the letters together, and they form a real, live alphabet city–a skyline of towering “e”s and low-rise “d”s and blind-alley “x”s. And what do you know? If we rendered our language in brick and mortar, it would approximate the Jane Jacobs ideal. There’s something deeply reassuring about that. For more stories on topographic visualization, go here and here.